Jesse Eisenberg. Rooney Mara. Justin Timberlake. Andrew Garfield. Bryan Barter. Drama. Colleges & Students. Computers. True Stories. Technology. Law/Legal/Solicitors/Trials. Big Business. 01 Dave W (Whisky) Faves. Rob Recommends. Dave T's Platinum Picks. 01 Ade tastics. Peoples' Choice. BAFTA (Best Film). Recommended. David Fincher seemed an odd choice when it was announced a film was to be made charting the early years of Mark Zuckerberg's creation of Facebook. Who could have predicted that partnered with writing ace Aaron Sorkin they could create a modern masterpiece of drama? 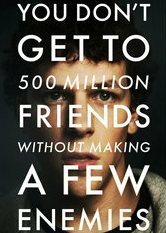 'The Social Network' is just that; compelling, relevant, insightful and hugely entertaining. Eisenberg's performance is a marvel in itself, creating a repulsive sociopath who is simultaneously hugely sympathetic, while the Winklevoss twins provide some of the lighter relief. Though not a comedy, you may find yourself laughing a great deal throughout the film, it's not that it's a gag fest, just a joy to watch. Superlative filmmaking all round.